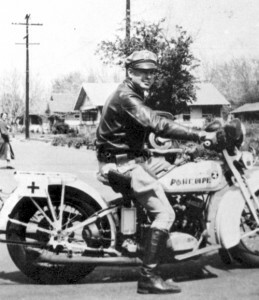 During the early morning hours of Friday, January 1, 1937, Officer Henry F. “Dinty” Moore was assigned with Officers G. D. Hyatt and Douglas Mecham to clear a traffic jam in the downtown San Bernardino area. 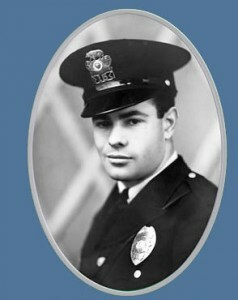 A six-year veteran of the department, Officer Moore had been a traffic officer for four years. Officer Moore was at the intersection of West 3rd Street and North F Street working to move New Year’s partygoers forward, out of the area. The San Bernardino Sun newspaper explained that Mr. Joel Hall was driving to the intersection at a high rate of speed. As he approached stopped traffic, he swung out of line and passed stopped cars on the right side. When he got to the intersection, his vehicle struck Officer Moore, who was directing traffic on the southwest corner of the intersection. Officer Moore was thrown 53 feet and was unconscious when fellow officers arrived at his side on the southeast side of the intersection. Officer Moore was rushed to St. Bernardine Hospital. He never regained consciousness and died from his injuries at 5:45 a.m. on Friday, January 1, 1937. He was the first San Bernardino police officer to die in the line of duty. “Dinty” Moore was 30 years old at the time of his death. He was a native of Crab Orchard, KY, and had lived in California for 15 years. He was the son of Justice of the Peace J. W. Moore and Mrs. Moore of Highland, CA, and was an honorary member of the Boy Scouts of America. He was survived by his wife (Dallas) and two sons (Teddy and Raymond). In April 1997, Mrs. Ruth E. Clyman wrote to the San Bernardino Police Department. She explained that she was at the house of Mr. and Mrs. Ralph Smith on December 31, 1936, with Officer Moore and other family friends. At 11:00 p.m., Officer Moore said, “Folks, I have to go to work.” She recalled hugs, good-bye kisses and New Year’s wishes as he happily left the house. Looking back over 60 years, she recalled that Officer Moore was young, good looking and popular among all her friends. Word reached the Smith household of the accident at 2:00 a.m. In addition to the San Bernardino Police Department’s investigation, the California State Motor Patrol (now known as the California Highway Patrol) conducted a detailed investigation. Mr. Hall’s vehicle, “although equipped with efficient brakes, continued for another 153 feet before stopping” (The San Bernardino Sun newspaper). Mr. Hall admitted to drinking three glasses of whiskey at a New Year’s Eve party. He was arrested “on suspicion of manslaughter” and was examined by a physician at the police station.